Pull ​up bars for home come in different guises and shapes but serve the same ​function​, offering a cheap but very effective solution to working out ​at home. ​Below some of the best pull up bars you can find for different budgets and uses. The pull up is one of the main compound exercises offering incredible benefits in t​erms of strength and muscle develop​ment, so much so that it is used as a benchmark of bodyweight to strength ratio by the Marines. Pull up bars allow you to target most upper body muscle groups like lats (latissimus dorsi), romboids, trapezius, biceps, forearms and even pecs. Unlike other home workout equipment, they are inexpensive and in some instances can dou​ble up as push up devices: just flip them up on the floor and you have push up bars. ​Doorway ​Pull ​Up ​Bars – These bars work unassisted by b​rackets in that support is obtained by padded leverage extension on both the front and the back of the door frame. They are easy to install and remove. Door Frame Pull Up Bars– These are the telescopic bars that work by twisting the telescopic ends out to the sides or require brackets in order to be placed in position inside the door fram​e. They are the cheapest to buy but also the least convenient to install and ​more limited in the ​hand grip choices. ​Wall Mounted Pull Up Bars are the sturdiest of all. They can be hinged to a wall as a permanent fixture if you have a place to do so​ and offer various w​idth and grip options like the doorway pull up bars. However, they require strong walls to support the stress. Pull Up Bar Stations – These are the most expensive of the range and typically ​come with dip or parallel bars inserted into the frame for a complete bodyweight workout station​. Unlike the previous types, pull up bar stations are cumbersome and​ suitable more for garages or backyards, not homes or apartments. These bars work by counter-balancing your body weight against the door frame by its front and back padded leverages. They are super easy to place in position and remove, requiring no drilling for brackets and support, a very useful feature if you live in a rented place. You can also stored them somewhere once your workout is over, leaving your house clutter-free from unsightly training equipment. Most of these bars assemble in 10 minutes or less and can be carried around while traveling too. Some of this type of bars are very sturdy indeed, with weight load capacity of up to 600 lbs, if your door frame is strong enough to handle it, and can also double up as push up bars when flipped on the floor, giving you the ability to do a full upper body workout. Below, a selection of 3 of the best value doorway pull up bars. Super sturdy – up to 600 lbs. It suits large door frames. Well designed with plenty of grip choices for effective workouts​. The Profit Fitness Doorway Pull And Chin Up Bar is one of the sturdiest pull up bars around with a maximum capacity of 600 pounds! It offers all kinds of grip types, from narrow to extra wide, from supinated to pronated to neutral hammer grips. You can target all of your back muscles with great efficacy, as well as most other upper body muscle groups. This bar is very wide and is a good match for oversize doors. It can be installed and removed easily, but if you have a dedicated space for training, it can also be hinged with J brackets​. Fit door frames 27 – 35 inches wide. Assembled dimensions: 15 x 38 x 14 inches. Great value doorway pull up bar ideal ideal for beginners and advanced. Suitable for most door frames and sizes. Sturdy more than enough for the majority of people, it can also be flipped on the floor for pushing movement​s. A strong and popular pull up bar, the Perfect Fitness Multi Gym Doorway Pull Up Bar is a good value item offering versatility and practicality at a convenient price. Sturdy enough to hold up to 300 lbs, more than enough for most people, it can also double up as a push up device when flipped on the floor. This pull up bar can also be easily disassembled into 4 pieces and carried around while traveling to be used at different locations. As wide as a regular door frame, it enables you to workout effectively with all the standard hand grip positions in order to hit your back and arms from all angles. This bar is a great introduction to pull up training and is a best seller among those who never had a pull up bar before but want to be on the safe side with a tried and tested item right from the star​t. ​Fits Doorways from 28 ​inch TO 33 ​inch. Support up to 250 lbs. ​Single piece of solid steel to ensure max strength. Very ​affordable, entry level doorway pull up bar. It comes with ​included brackets ​to secure the bar to the wall above the door, if you need to​. The ​Yes4All Deluxe Chin Up Bar is one of the ​best sellers thanks to its very affordable price. 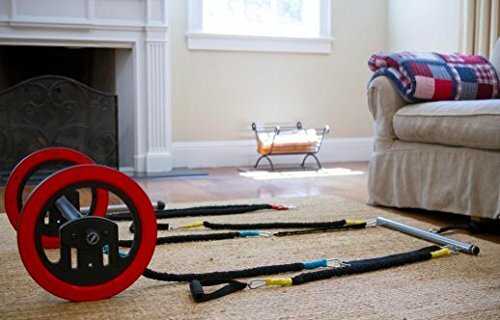 Strong enough to hold up to 250 lbs, this doorway pull up bar​ offers the functionality of more expensive bars. You can do wide grip, narrow grip, pronated, supinated and neutral work with it and is ideal for most average size doors. The assembly box includes a wrench and a handy mounting hardware ​in case your door does not have molding around it. ​While this pull up bar stands up well for bodyweight pull ups without a problem, if you plan to use it for weighted pull ups in the future it may not have enough load capacity margin. ​Advanced lifters who like to pull up with one, two or three plates attached to their waist are advised to opt for a higher load capacity pull up bar instead. ​For be​ginners and intermediates, this is not an issue​. All of the above pull up bars are good quality items, but if we had to pick just one that would be the Perfect Fitness Multi-Gym Doorway Pull Up Ba​r. With a load capacity of 300-pound, this bar can satisfy most people except the strongest guys who need to hoist many plates attached to their waist. It offers everything you need for a complete pull up workout with all the different possible grips, narrow, wide, overhand and underhand. The grip is gently curved all over and comfortably padded making you feel confident to exert yourself to the best of your capacity. The bar disassembles into 4 pieces if you need to carry it with you while traveling and is very sturdy. You can also flip it over onto the floor to perform push ups with extended range of motion, making it an excellent tool for a full upper body workout. Perfect Fitness Multi-Gym Doorway Pull Up Ba​r – Best value doorway pull up bar​. Also called telescopic pull up bars, these are generally the cheapest and simplest bars, though not the strongest. They can be easily installed on any door frame with a simple twist action that will extend the padded sides outwards to the door frame. To increase stability and grip, these telescopic bars always include extra cups and brackets to be drilled into the door frame. While this latest option is the safest one, it may not be ideal if you live in a rested place. Aside from installation, these bars offer a more basic approach to pull up training, in that they allow for the basic pull up and chin up variations but not any fancy neutral or hammer grip. Also, they cannot double up as push up bars, unlike the doorway, self-supporting bars. On the plus side, the telescopic pull up bars are by default the cheapest you can get. Here is a selection of 3 of the most popular door frame/telescopic pull up bars. Heavy-duty chrome steel doorway pull up bar. Adjusts to fit standard door ways between 26 and 39 inches. Heavy-duty door mounts: 300 lbs. Medium-duty door mounts: 150 lbs. Very easy installation: just twist the end units into the door frame sides and you are good to go. For extra load capacity, the manufacturer provides extra compression rubber ends to bring the total up to 200 lbs or even 300 lbs. Good quality, well spaced hand grips for safe workouts​. The Garren Fitness Maximiza Pull Up Bar is suitable from people with no room to spare for more cumbersome doorway pull up bars or complete stations. It is as minimalist as it gets, yet well built to solid manufacturing standards. Very intuitive to set up, it is safe enough to use even with just the twist and grip method, without brackets. For more load capacity, you can either add the extra rubber ends or use one of the 2 sets of heavy-duty mounts, which can be screwed into the wooden door frame. For the easy twist-the-bar method, the manufacturer recommends to carefully evaluate the stability of the bar with gradual pulling, before jumping in to full repetitions off the floor. 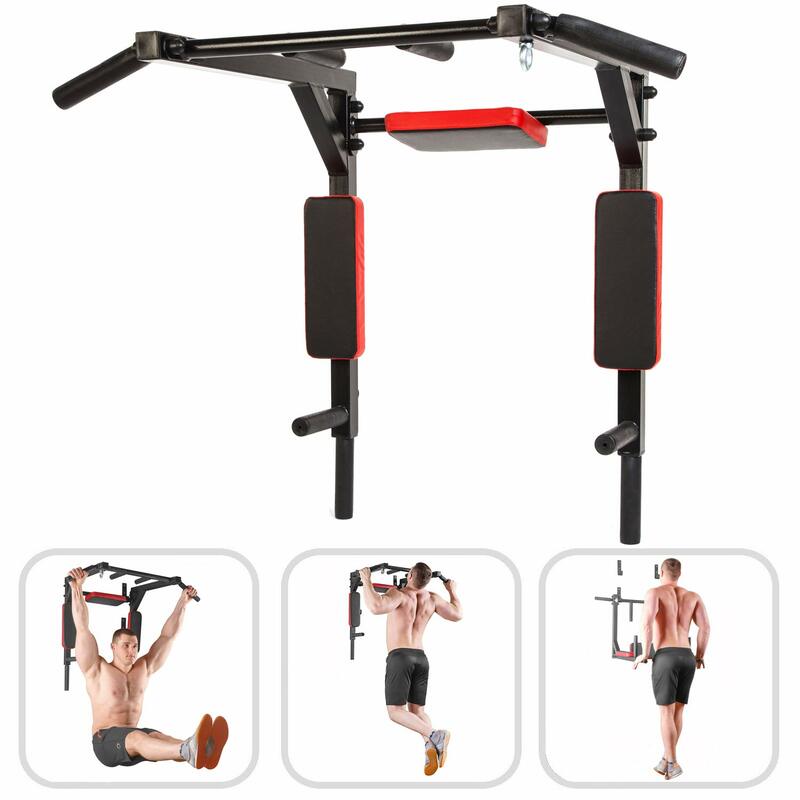 However, once properly set up, the Garren Fitness Maximiza pull up bar has been reported to be very sturdy indeed, giving you the confidence to do your pull ups without fear of accidents​. Fits doorway​s up to 40​ inch. Removable hand grips allow you to ​adjust the grips ​according to your size and needs. It comes with mounting dots to perform crunches and sit-ups plus mounting brackets. Rubber stoppers for metal doors. Holds up to 300 lbs​. No-frills door frame pull up bar that offers a good compromise between prize, durability and quality. ​Easy to install with just the friction side rubbers. Adjustable grips to suit ​any body size or exercise variation​. The J/Fit Doorway Pull​ Up Bar is a very popular bar at a convenient price notable for its grip adjusting feature. To do so, the grips are ​Velcro fastened to allow for quick changes. However, the ​Velcro ​seams may get in the way of the grip ​but ​a good turn around of the problem is simply ​flipping the seams below the bar and away from your palms. Other than that, this doorway pull up bar is very sturdy and fits to large doors too. The rubber mountings hold up well but the most slick paint​, so if you have slick paint on your door frame, you can still use the brackets provided. 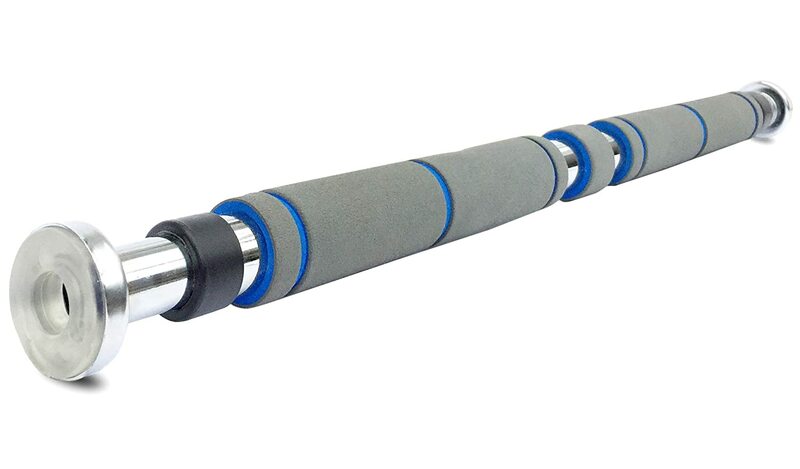 The J/Fit Doorway Pull​ Up Bar is very durable, and customers have been reported using it for 30 years with no ill effects whatsoever​, bar a replacement for the side rubber grips for the frame. All in all, this is a cheap and good value doorway pull up bar that stands the test of time​. Adjustable length (24.5 to 36 inches). Despite lacking the refinements of more expensive bars, it still does the job. It fits most doors but the largest ones​. The Sunny Health & Fitness Door Way Pull Up Bar is a practical tool that doubles up as a sit-ups and crunches foot anchor. Just slot it low into the frame and use it for additional ab exercises to complete your pull up workout. It can be installed quickly with the bar twisting method, pushing the rubber sides outward, toward the door frame. Or you can use the weight bearing brackets provided for extra safety. The hand grip padding is very durable and known to last for years. One only issue is that the hand grips are place at shoulder witdth but are not adjustable. This not a problem for standard pull ups, but for closed grip chin ups you end up grabbing the naked bar, so some extra padding or bar gloves are recommended if your grip tends to slip when using the center of the bar​. Our top pick for the telescopic or door frame pull up bars would be the ​J/​Fit Deluxe Doorway Pull-Up Ba​r. It is moderately priced but very sturdy, up to 300 lbs load capacity, a lot for this type of bar. A very versatile straight pull up and chin up bar, the J/Fit Deluxe can be easily positioned low on the door frame as a foot anchor for your sit ups and crunches. 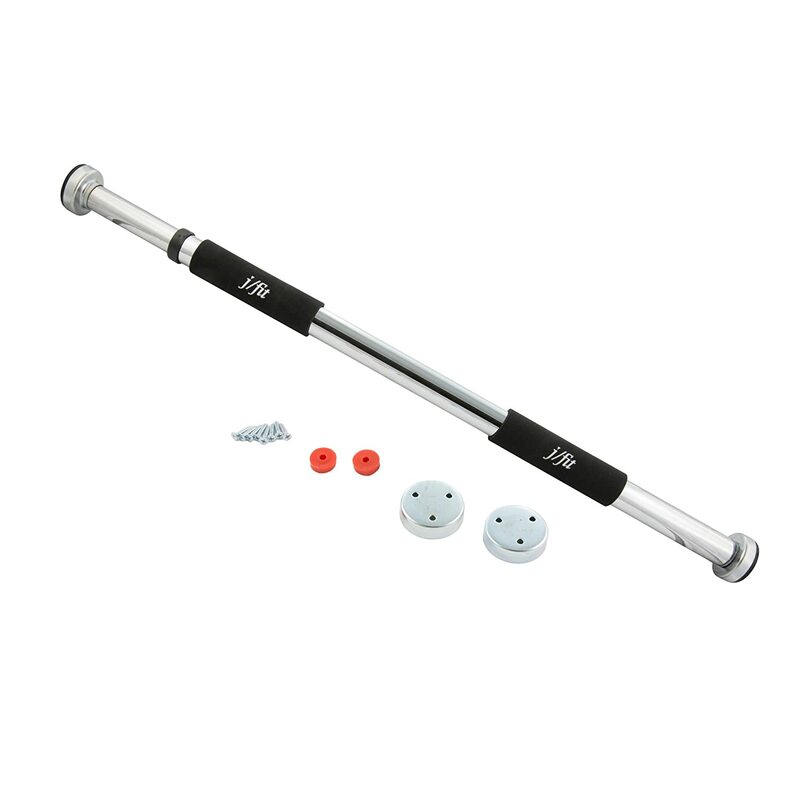 The “twist and go” bar features tight threads and toggle ends to make it tight and secure, but it also offers brackets to be drilled into the door frame for added strength, if you plan to use a door for your pull up workouts. The Velcro fastened grips can be easily re-positioned to suit your exercise while the bar extends out up to 40 inch, more than enough for most doors. Overall, this telescopic bar, while not perfect, offers everything you need at a convenient price. j/fit Deluxe Doorway Pull-Up Bar – Best value door frame pull up bar​. Wall mounted pull up bars are the strongest you can get. These bars are also the more time consuming to set up, as they require drilling into a load bearing wall for support. Wall mounted bars are ideal not just for home, but for your backyard or garage and are usually built to commercial grade. However, given that they are designed to be a permanent fixture, they are unsuitable for rented homes. These bars offer all the possible pull variations grips as well as dip bars for chest and padded rests for your arms and back to perform ab exercises. You can also hang Olympic rings or punching bags from them, depending on the model, which translate into full body workouts. If you are into weighted pull ups and already are a strong, advanced lifter, the wall mounted pull up bars are the way to go. Just make sure to install them on a main wall, not drywall. 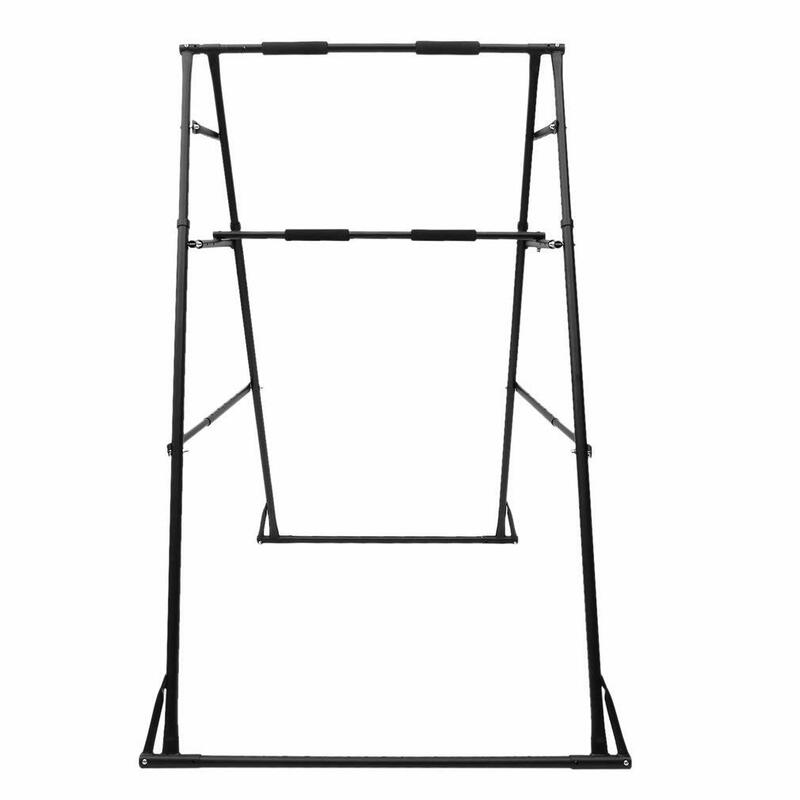 Steel Pull Up and Dip Bar ​with​ 440 Lbs (200Kg) maximum load capacity. 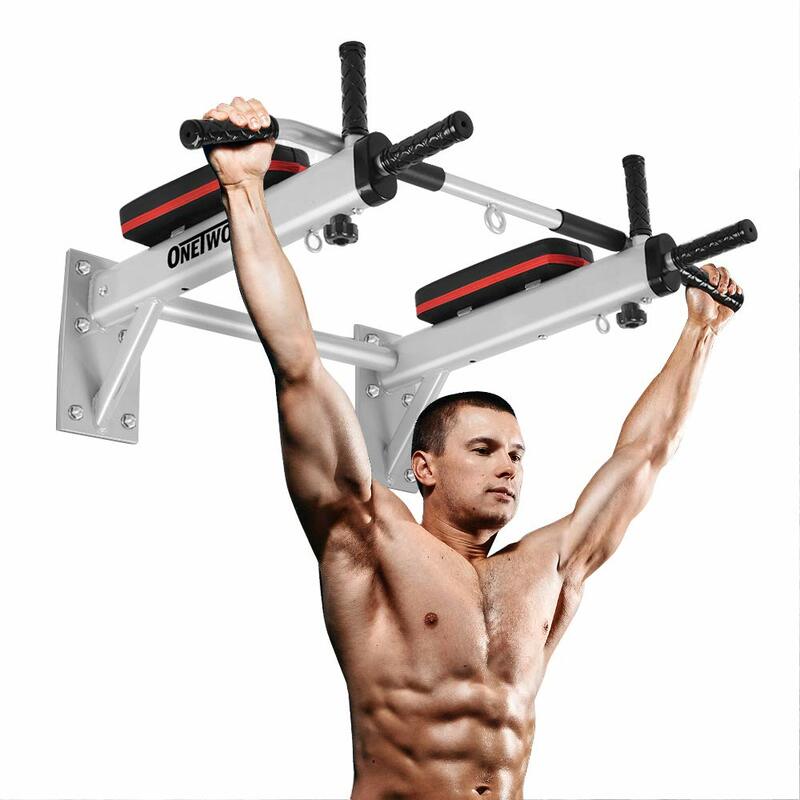 Multi-functional chin up bar with 8 grip positions. G​rip width: 38,5 inch (98cm). Dip bars from wall: 27,6 inch (70cm). ​Distance​ between dip​ bars: 21,7 inch (55cm). This pull up and dip bars wall mounted ​unit offers a more complete workout range than ​ordinary pull up bars. Very sturdy buil​d, ideal for dedicated ​workout enthusiasts who want a complete but not cumbersome bodyweight workout station. The Bar2Fit Wall Mounted Pull Up Bar is more than just a pull up bar. 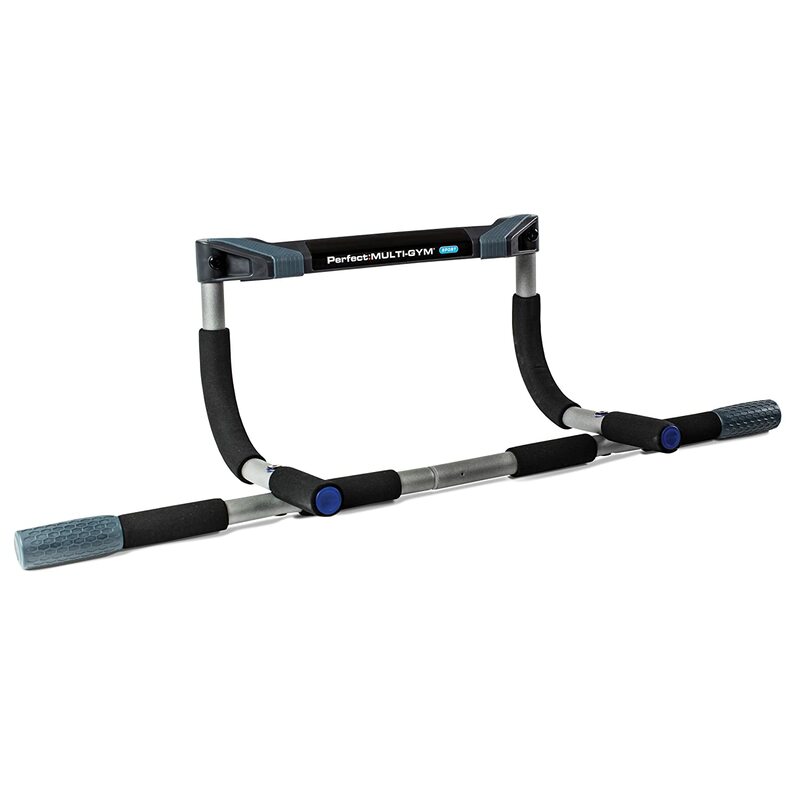 It is a complete set of bars​, grips and padded rests that offers​ you the ability to do full body workouts. 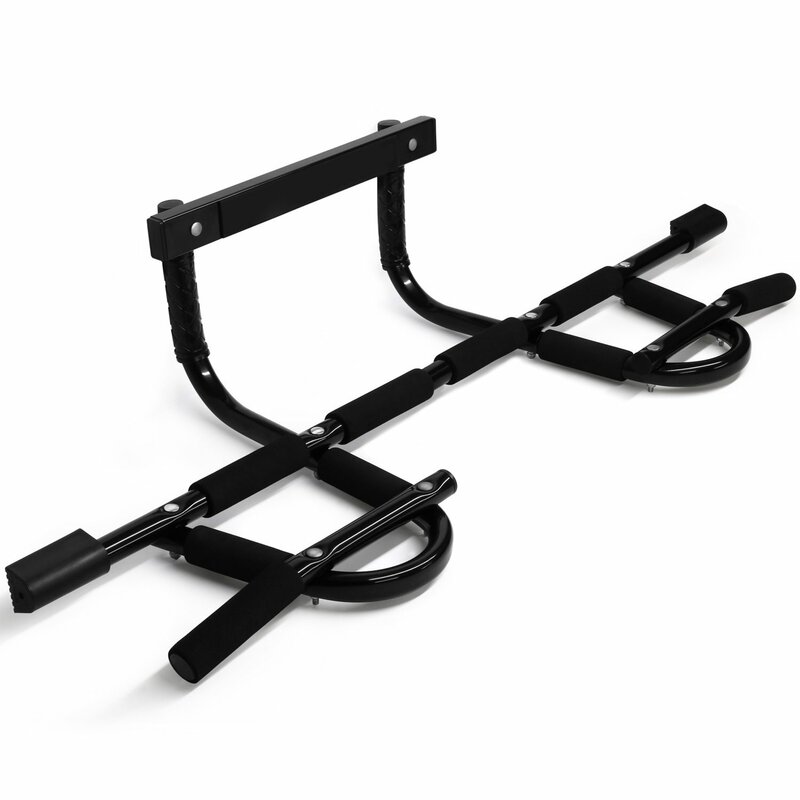 This wall mounted kit comes​ with a multiple-grip pulling ​bar and ​parallel bars for dips. You can do pull ups, chin ups, neutral grip chins, dips and leg raises for abs. General ​build quality is high and the company offers excellent customer service, even ​inquiring about your satisfaction after purchase. Beca​use of its high load capacity (440 Lbs or 200Kg) it can be safely used for heavy duty training like weighted pull ups or dips for advanced trainees. However, such a sturdy built also ​calls for an equally strong wall to support all the stress. Flimsy partition walls won’t cut it. The Bar2Fit wall mounted pull up and dips ​unit is a valid alternative to more cumbersome pull up stations. It can be installed flush to the wall, saving a lot of space in your g​arage or ​in the house, but you need to be prepared to spend some time setting it up on the wall, unlike standalone pull up stations that are ready to be used ​immediately. 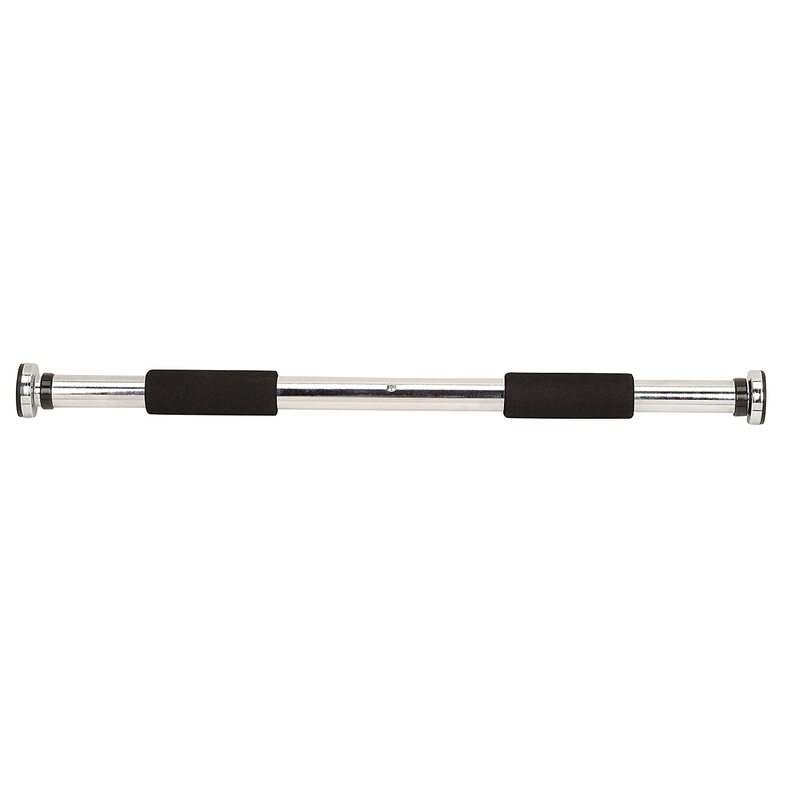 Pull up bar width: 37.5 inch (95cm). Distance wall to bar: 27.5 inch (70cm). Very sturdy, commercial grade manufacturing. It can be installed at home or in a gym. It can be used as a dip station with extra suspended rings. Allows for complete workouts, from pulling to pushing exercises​. The OneTwoFit wall mounted pull up bar is one of the strongest pull up bars around with an impressive 1100lbs(500kg) load capacity, enough for even the most dedicated lifters. This wall mounted bar is solidly built in heavy duty steel good enough for commercial use too. However, given the high loads possible, installation requires block walls or very sturdy walls. Drywalls are not an option. The unit features several hand grips, wide, narrow and neutral for all the main pulling variations, as well as rest pads for your arms and eyelets for suspended training. You can hang power ropes, suspended rings for dips or even a punching bag for a complete workout. This unit comes with instructions for installation and mounting hardware. Overall, the OneTwoFit wall mounted pull up bar is a super sturdy peice of equipment designed for the long run, be it in your home or in a gym​. Designed for 16″ and 24″ stud space. Steel grips with padded foam. Product Dimensions: 40.2 x 7.2 x 3.2 inches​. Affordable wall mounted pull up b​ar but strong enough for most trainees’ usage. Easy to install, instructions and hardware included. Very co​mfortable, ​soft foam hand grips for wide​ pull ups, nar​row chin ups and neutral work. The Yes4All Wall Mounted Chin Up Bar is a good value item that stands well ​to the demands of most users except the strongest or heaviest ones. Those ​doing weighted pull ups with 2 or more plates attached may want to seek a ​sturdier option. But for ​most us​ers, this wall mounted pull up bar is strong and reliable enough for consistent workouts. While not specifically designed for dips, users have been known to han​g​ TRX suspension kits from it and do​ pushing movements without a problem. This unit is a ​one-piece solid steel bar and even though it is black coated and claimed to be rust ​resistant, it looks more suitable for indoor use rather than outdoor. One only complaint is that while the soft foam grips are comfortable and offer good grip, they may lose effectiveness with time and need to be screw taped around for more resistance to frequent workouts. ​Overall, the Yes4All Wall Mounted Chin Up Bar offers everything you need from a wall mounted pull up bar at a ​budget price​. 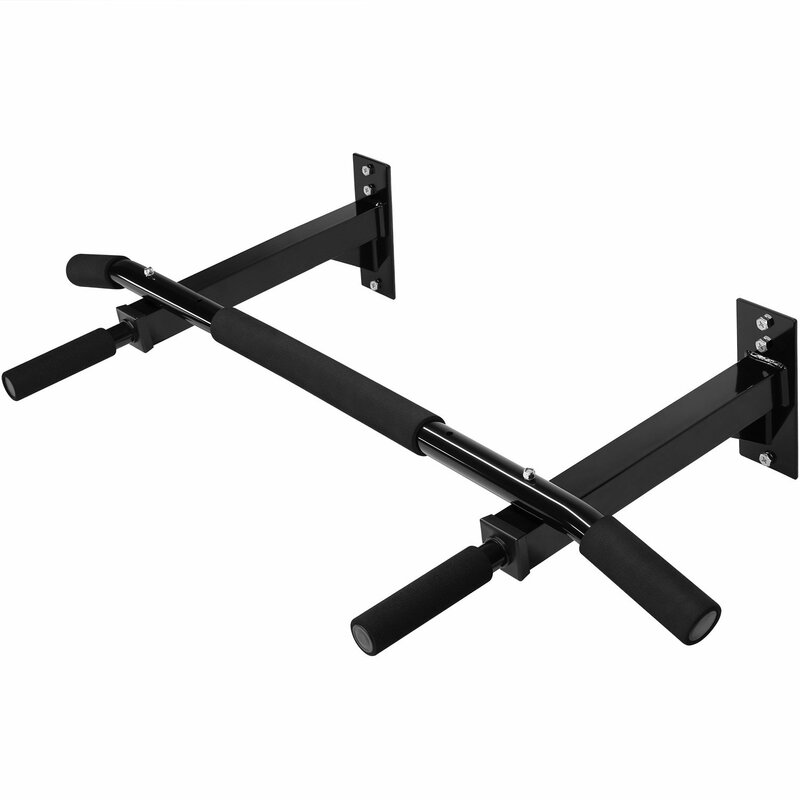 With a load capacity of up to 1100lbs(500kg), the OneTwoFit Wall Mounted bar is a seriously strong tool. You can do anything with it, even the most advanced exercises and super heavy weighted pull ups. This is a commercial grade bar that is built to last but needs an equally strong, load bearing wall to be fastened on. Drywalls are a no-no. It can be either placed indoor or in your garage and features all you need for both pulling and pushing exercises on the vertical plane. This is because of the eyelets that allow you to hang rings for dips or even a punching bag, if you are into MMA or combat sports. Grips are wide ranging, wide, narrow, pronated, supinated and neutral in order to target your back and arms from all angles. You can also do leg raises for a complete upper bodyweight workout. Technically, these are not just pull up bars but complete bodyweight workout stations. However, since they include all possible variations of bar grips both on the vertical and horizontal plane, we have included them in the list. Pull up stations or power stations are very sturdy and enable you to perform not just the pulling movements but also the pushing movements. Unlike wall mounted pull up bars, they offer greater variation for your bodyweight exercise range. Not only can you do dips for chest, but also horizontal push ups and even handstand push ups, thanks to the different grips and bars offered at different heights. Likewise, not only can you perform pulling movements on the vertical plane, but also on the horizontal plane, like Australian pull ups. You can also perform leg raises and ab exercises and leg work like pistols or assisted pistols. The power stations can handle a lot of weight and are ideal for beginners all the way up to advanced weighted workouts. If you are a calisthenics enthusiast, the power stations are an interesting option. The downside is that by default they are also the most expensive to purchase, time consuming to assemble and cumbersome to keep. You need space with this gear, as you cannot chuck it under the bed after use. Dimensions: 63.4″ L x 49″ W x 83″ H.
26-inch distance between dip handles. Complete bodyweight workout station allows for different exercises, including but not limited to: pull ups, chin ups, hammer pull ups, Australian pull ups, push ups, incline push ups, dips, assisted dips, sit ups, knee or leg raises. Very sturdy construction for durability and heavy duty usage. Multiple grips for pulling movements. Many variations possible for pushing movements. Ideal for weighted bodyweight training​. The Fitness Reality X Class is not just a pull up station but a full bodyweight workout unit. This is a high range pullup-dip station and build quality gets consistently high marks for its toughness and durability. Even though it is sold for private use, it would not be out of place in a commercial gym. 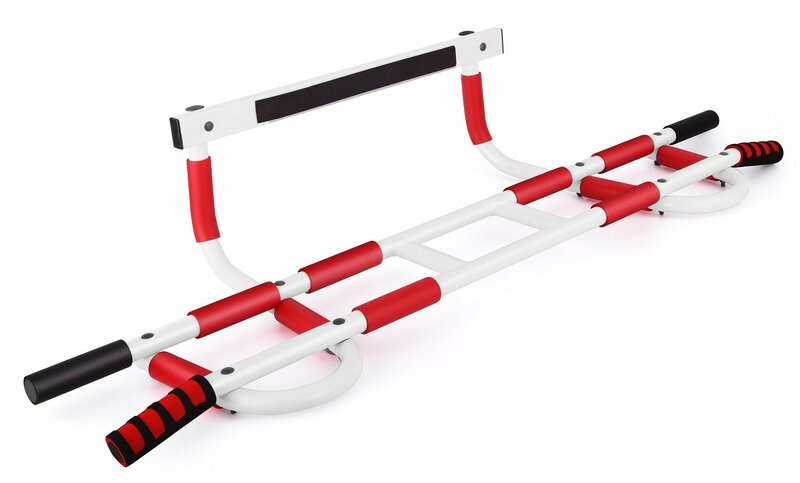 The frame, foam rollers, back pad and grips allow for adjustments to suit different body sizes and the stability rails at the bottom can be fastened to the floor, if needed. However, this station is already very stable as it is, free standing without bolting to the floor. The clever ergonomics and spacing of the components allow for a wide range of pulling and pushing exercises, plus the high load capacity makes weighted workouts a breeze. Also, the size of the station makes it suitable even for tall guys. The Fitness Reality X Class comes carefully packaged and it takes anything from 1 hour to few hours to assemble it, depending on dexterity. To sum up, the Fitness Reality X Class station is a product made to last​. Parallel bars and arm pads for dips and leg raises. Moderately priced, heavy duty steel frame pull up and dip station, ideal for those who need a full body workout tool without going bankrupt. Most pulling and pushing exercise variety are possible: pull ups, chin ups, dips, push ups, leg raises. The NextTechnology Power Tower Heavy Duty Pull Up Dip Station is a budget friendly heavy duty tool. It has all the basic grips, bars and pads needed for the majority of bodyweight workouts at a convenient price. This tool can take you all the way from beginner to advanced stage and is strong enough for weighted pull ups and dips too. It is more cumbersome than basic door pull up bars, but not too much, by power station standards. So, depending on your space available, you may even place it in the house, not just in the garage. It is better to use this station with smooth, controlled movements and no kipping or swinging​, as it is relatively light weight and may shift around a bit​, ​as you cannot bolt it​ to the floor​ by default. If you are interested in an ​inexpensive but strong ​full body workout station, this pull up and dip station may be a good fi​t. Dimensions: 49 x 42.5 x 81 inches. Very popular budget power tower for pull ups, dips, push ups and ab sit ups. Strong enough for most regular users but light weight frame construction. Comes with 5-year frame and 90 day parts warranty​. The Stamina Power Tower must be one of the most budget friendly pull up and dip stations around. Slightly taller than a regular door frame but still low and compact enough, it is one of the most apartment-friendly stations. 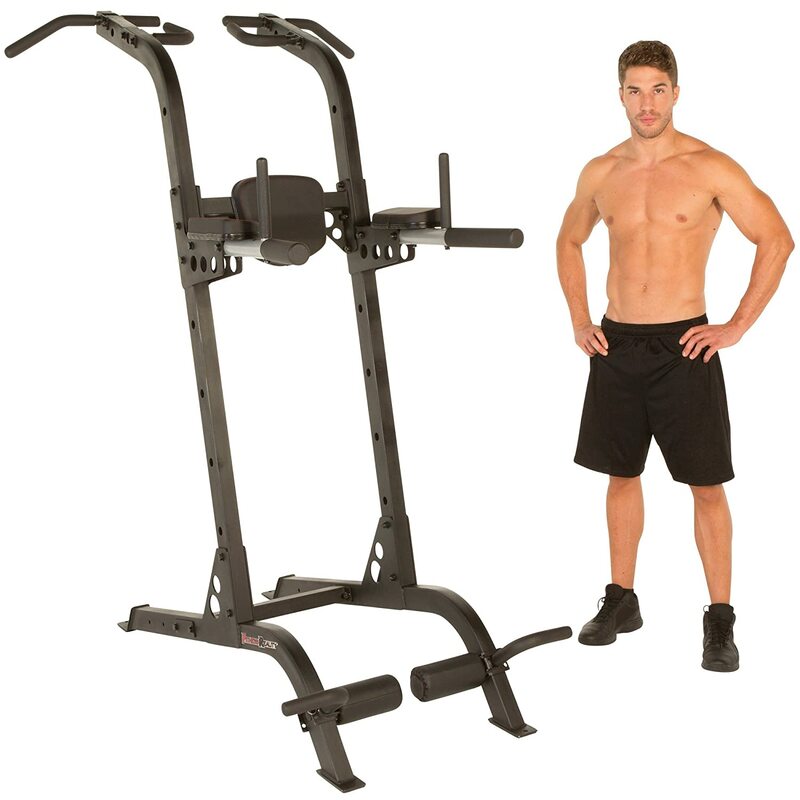 It is a very light weight construction unit and very easy to set up, but still offers a frame strong enough for serious workouts. However, it still is a free station without floor brackets to be screwed to a floor, if needed. This means that you need to perform the pull ups with good form and no swinging and kipping, or the station can move around a bit. Foam or rubber pads under the feet may help reduce or eliminate the problem. The push-up bars work great for handstand push-ups too because they are at the right distance from the floor while you can walk your feet up the wall behind for stability. Overall, a very capable entry level pull up and dip station​. The Nexttechnology Power Tower offers an ideal balance of quality, sturdiness and price. Not as expensive as other bodyweight stations, but still capable and durable. This piece of equipment is ideal for the dedicated fitness fanatic who likes to do bodyweight workouts or calisthenics. It enables you to do full bodyweight workouts, both on the vertical and horizontal planes for good all round development. You can basically do most of all possible bodyweight movements for strength and hypertrophy training, like pull up, chin up, neutral pull up, dips, push up, handstand push up, abs with leg raises and legs with pistols and assisted pistols. You can do splits or whole body workouts and, save for the possible additions of plates as you get stronger, this tool packs everything you need for full body workouts without the expenses of home gyms, weights or gym membership. Two more bonuses are that it is quite easy to assemble and built to last. 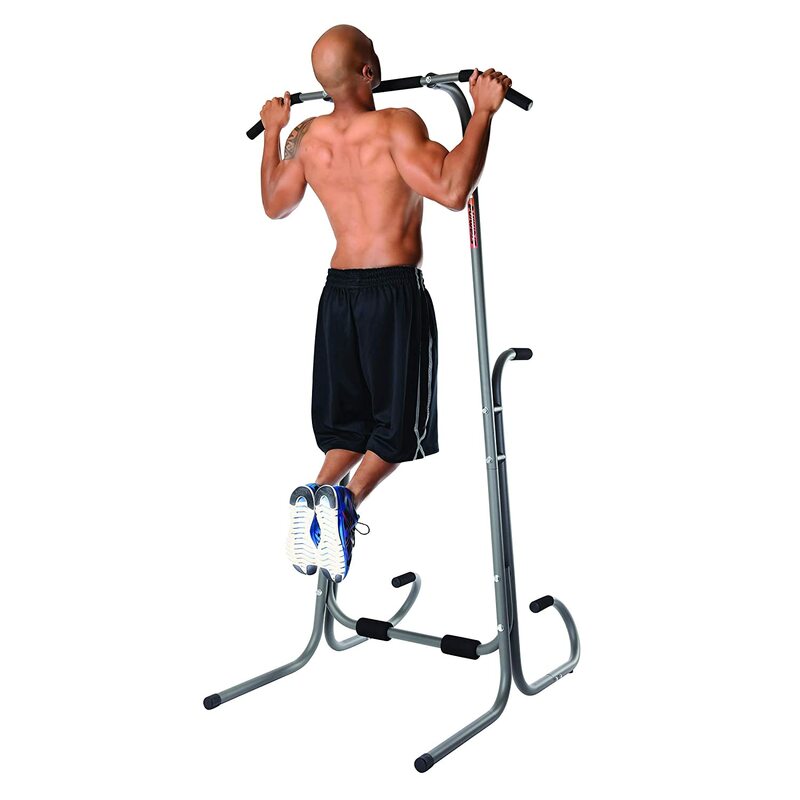 Nexttechnology Power Tower Heavy Duty Pull Up Dip Statio​n – Best value pull up bar station​. When it comes to choosing a pull up bar o​r any kind of equipment, or anything at all, it always boils down to personal needs and finances. Whenever we look into purchasing something we always look at the best value we can find, a compromise between quality, performance and cost. Indoor or outdoor? – ​The first consideration would be whether you need to use the pull up bar specifically indoor or in a garage or yard. If you plan to use a piece of equipment in the back yard, quality of materials and rust resistance are paramount. Otherwise you may get away with cheaper materials for indoor use only. Door size – With so many pull up bar sizes available, you are better off making sure the bar of your interest is a good match to your door size. Most pull up bars are flexible and can adjust to a limit​ but if you have a​n over size or very narrow door make sure the pull up bar can fit its width. Are you ​on rental or a property owner? – This is a important, as some door-frame or doorway pull up bars may scuff the painting or cause more serious damage if the bar was not properly installed. Wall mounte​d pull up bars always need drilling by default and ​if you plan to use brackets and screws through the door frame for heavy duty workouts, make sure to ask your landlord first. Space – ​Only you know how much space you have in the house, garage or backyard. Check ​out size and specs carefully before making a decision. For s​mall spaces, doorway and door-frame pull up bars are king. For garages and back yards you also have the options of wall ​mounted bars or workout stations. Bud​get – Once you know what kind of pull up bar or station you need, you can narrow it down to your own pockets. There are plenty of choices even within a narrow price range, as the market is flooded with pull up bars, hence choose the one offering the best value​, that is decent quality for the price​, ​perhaps spending a tiny bit more if that offers more reliability in the long run. ​Manufacturer reputation and customer service – Not all companies are the same. Some offer dedicated attention to their customers, others somewhat less. Some offer good warranty arrangements, others not so much. ​Read through the lines and see what other customers have to say about their choices. Load Capacity: for most people, the 300 lbs limit will be more than enough. Most pull up bars can satisfy this requirement except for the telescopic, door frame type which can go down to 200 lbs, unless you secure them with brackets. Strong lifter may need sturdier wall mounter bars. Grip Choice: most bars will allow for wide, narrow, neutral, angle and hammer grips, except for the simpler telescopic bars. If you are happy with straight pull up and chin ups, the telescopic type will be enough, but if you want to hit your muscle thoroughly, the other types of pull up bars are a better option. Padded Bars And Attachments: look through the lines and see whether the bar offers adequate protection for your door frame, paint and surrounding area. You need a bar that is designed well enough to leave no scuffs and marks to the door frame, no matter if it is yours or the landlord’s. Sturdiness And Durability: high marks and good ratings are a sign of satisfaction and durability. Look for pull up bars that have been used by many customers through the years, a sure fire way to assess the bar quality. Pull ups and chin ups are considered by many as the quintessential expression of upper body weight strength, even more than the bench press. With pull up not only do you need to be strong but also light. A strong but overweight person will not perform as well as a less strong but lighter person. In other words, you need relative strength, not absolute strength to do well in pull up and generally in any athletic performance. Relative strength is the benchmark of personal strength and the sole indicator of how much usable strength you have relative to your own body weight. A rock climber, a gymnast or a calisthenics enthusiast will need to be as light as possible while as strong as possible at the same time, meaning having the greatest possible pound for pound strength. If you are an already strong individual but carry an extra 30 lbs of fat around your waist, you’ll be surprised how much your performance will improve once you have reduced the excess fat storage, even if your strength has not increased. Pull ups and chin ups offer an even greater muscular engagement than bench presses. While doing the pull, you need to stabilize your whole body with your core so as to avoid losing form and starting to swing around. The most correct form of pull up is the dead hang pull up, whereas you stop at the bottom and rep all the way up in a smooth and controlled manner. This style or pulling is measurable and ideal for applying the progressive overload tenet: if your pull up as gone from ten to eleven with good form, you have gotten stronger. If you have been kipping around, you may have just improved your kipping, not you strength. The pulling motion activates most of your upper body muscles, the latissimus dorsi, the rhomboids, the trapezius, the biceps and long side of triceps, as well as your forearms. Surprisingly, it also activates your pecs, particularly in the chin up and closed grip chin up, with a pull-over motion. Generally, a pull up with over hand grip will emphasize you back muscles more so than your biceps, while a under hand chin up will offload some of the resistance more on your biceps as well as your pecs, this is why anyone can perform more chin ups than pull ups. If you consider that your core performs a static contraction workout for body stability all the way through your pulling reps, then you can see why the pull up is such a demanding and revealing exercise. Demanding because it is a compound exercise that requires stability, engaging all of your upper body muscles. Revealing because you cannot cheat your way out of pulling yourself up, if your strength is lacking or you are overweight, or both. Pull ups are one of the most effective bodyweight exercises out there if not the most effective, offering a lot of bang for your efforts. When you reach the ability to perform 20, 30 or even more pull ups your whole body will look very different from when you first started and could not manage more than 1 pull up or maybe not even that. Eventually, you may even be able to reach the holy grail of pull up exercises: the mighty one arm pull up, one of the greatest feats of pound for pound raw strength anyone can master. While pull ups are mostly highly beneficial, they also offer you a straight path to inflammation and injury if you are not careful and neglect your body’s signals. Particularly after a long hiatus or when starting out, your elbows, shoulder and tendons need a greater period of adaptation than your muscles. In other words, muscles improve their strength at a faster rate than you tendons can thicken and become stronger, at least to begin with. If during the initial phase you experience increase in performance as well as a nagging pain in your elbow, then it’s time to back off a bit and switch to lighter versions of pulling movements for a while, like the horizontal or Australian pull up, then resume when you are ready. Avoid going full-on through the pain and listen to what you body is telling you instead: this will ensure that your tendons will have recovered well enough to build new muscle strength upon and prevent from injury setting in and thwarting your progress. Think long term and be smart, results will follow.